Are you facing an IRS tax audit? Before you navigate these treacherous waters, make sure you have sound audit representation on your side. The goal of an IRS audit is to verify that income, information, expenses and deductions were accurately reported to the IRS on a taxpayer’s tax return. An audit can result in the IRS assessing additional taxes, interest and penalties. Even worse, a seemingly innocuous audit may result in criminal prosecution. This is referred to as an “Egg Shell Audit.” With so much at stake, it is easy to see why an audit can cause serious anxiety. The best option for most New Jersey businesses and individuals facing an audit is to work with a qualified, experienced tax attorney. A tax lawyer can help limit the risk exposure and scope of an audit. Tax laws are not black and white and having a tax attorney advocate on your behalf can increase your chances of success against the IRS’s audit examiners, accountants, and attorneys. Handling the audit through the IRS’s Office of Appeals, not the audit level, will achieve the best results. Litigating the matter in Tax Court is necessary. An Audit Reconsideration would be proper. Many taxpayers think that their accountant can provide all of the support they need for the audit process. This can be a dangerous mistake. A NJ tax attorney has one decisive benefit over accountants, and that is attorney/client privilege. You can share anything with us, and our firm will not be asked to share the information with IRS agents or in court. Your accountant can be asked to testify against you in court, but any information you share with your tax attorney is legally protected. Also, tax attorneys are trained at researching, negotiation, and advocating. The tax code, regulations, case law and administrative guidance can make researching tax laws complex and having a tax attorney can provide the representation that you need. .
We will guide you through the IRS agent’s innocent sounding interview questions at your IRS audit meeting, helping you answer honestly without raising red flags. 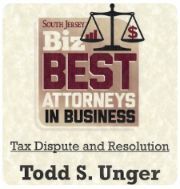 With the help of tax lawyer Todd Unger, you can level the playing field. Todd S. Unger, Esq. LLC, provides consultations to taxpayers facing audits and other federal tax controversy matters in both New Jersey and New York. To schedule your confidential consultation with a qualified New Jersey tax attorney, to discuss getting audited by the IRS, call us today at (877) 544-4743, or fill out our contact form.